Our owner and founder, Tim, shares his favorite recipes for 100% Wild Alaskan shellfish, salmon and whitefish, along with a selection of gourmet seafood from around the world. Bon appetit! Super easy, but oh, so elegant. 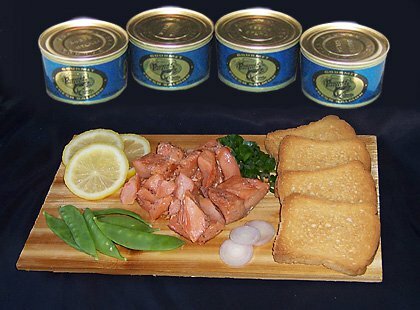 Use our Lemon Caper Sauce to add the taste of tart capers and lemons, balancing the rich wild salmon filet. Our cedar plank creates a woodsy smoke flavor that is decadent and rich. Try it this week, right on your patio grill. Grilling delivers an octopus thats both crisp and tender. Make sure your fire is hot enough to crisp the exterior without drying out the interior. Serve this with anchovy bread and a warm salad of bitter greens. The soy-honey glaze and wasabi pairs well with the salmon for a delightful balance of flavors. You'll love this salmon with oranges, pepper, and a little vinegar. A delicate sauce with capers and lemon, and healthy Alaska Sockeye salmon. Sun dried tomato and ginger team up to make an exotic, mild poached salmon dish. Light and delicate, with the bright tastes of early season vegetables. This fine presentation is easy to make, and ready in minutes. Blackened king salmon with vermouth and walnuts. Simple and delicious, pan broiled salmon with a touch of garlic. Famous Yukon King Salmon in a rich cranberry and ginger marinade. Garlic and butter makes this recipe delectable. Great for those quick evenings. Seriously amazing, perfect with the cilantro mayo. Try this Teriyaki to wake up your taste buds. This salmon with a little Asian slant is different and delicious. Everyone likes the classic sauce for dipping crab legs. Melted butter is nice, but try something different with these sauces. With King Crab and Smoked Salmon, this is a sensational hit for entertaining. Fresh herbs and Brut Champagne make an elegant sauce for King Crab, from genuine Alaskan chefs. Only 15 minutes prep and cooking time for this delicious and simple Grilled King Crab Legs. Smooth and rich Aioli, with just enough heat. 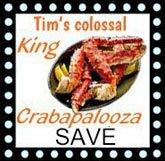 You can thaw and eat these Crab Legs cold; or try these perfect cooking instructions for Crab Legs with drawn butter. "This is a great way to serve Alaska King Crab Legs; and a great alternative to the usual method of steaming and serving with drawn butter. It's been a traditional favorite in our family for years!" King Crab, Champagne and Vanilla Risotto: elegant! Shelled crab meat in white wine and herbs... try it over rice or pasta. Corn flakes makes a crispy coating, and cilantro adds zest. Lemon combined with garlic make an excellent Halibut entree. The marinade gives this recipe a very exotic taste. If you've never tried Halibut cheeks, you're in for a special treat. They are sweet, almost like lobster, and can easily be prepared with three different cooking methods. Serve this quick halibut cheeks recipe with rice and snow peas or asparagus. Halibut cheeks and pasta with lemon - what's not to love? The acid in lime juice essentially "cooks" the fish without using heat. Grilled Halibut is easy and delicious. 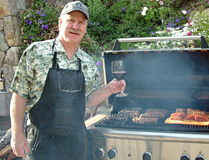 A saucy barbecue for Alaska Halibut on the grill! Sweet Thai Chili Sauce adds genuine Thai flavor. Alaska Halibut with Green Chili. Halibut steaks on the grill with a southwestern twist. Ginger and garlic flavors, plus grilled citrus slices. These flavorful tacos feature halibut or any other true white fish. An exteremly good New Orleans style shrimp, and also low-salt for your health's sake. The secret is marinading these beauties at least 12 hours. Poached in garlic broth, tossed with angel hair pasta and a touch of lemon. This is messy. Use your fingers and have fun! In a tasty soy sauce marinade. Shrimp, Green Beans, Rice...mmmmm! Add chopped fresh tomatoes for a real summer taste! Notes of soy and ginger in the marinade give the tuna an Asian flair. Quick and easy, less than 15 minutes cook and prep. Sesame seeds add a richer flavor without overpowering the featured tuna. Compliment the perfect sashimi with light flavors of cucumber contrasted with spicy soy vinaigrette and jalapenos. Black cod is steeped and marinated in sweet miso before being broiled. The world's best beer batter recipe. Made with a really good beer and a little malt vinegar. Fish & Scallops: The best way to thaw your fish or scallops is to leave them in the refrigerator overnight, allowing at least 8-10 hours. Sometimes the vacuum packages lose their seals in transit. This is normal. In those cases, use those packs first by taking the fish out of the packaging on a plate with plastic wrap over it and place in the refrigerator overnight. For quicker thawing, place the vacuum sealed pouch in a bowl of cool water for 30-46 minutes. Do not use warm water, as it can cause the seafood to lose flavor and texture. Crab:Crab is pre-cooked and can be thawed and eaten cold or cooked from frozen. Prior to cooking, rinse crab under cold water to remove salt water brine coated on legs that is used to preserve freshness. Lobster: For best results, put lobster tails in their wrappers on a plate in the refrigerator the day before you plan to cook them. If you don't have time, soak the lobster tails in cold water until thawed. Lobster claws are pre-cooked and can be thawed and eaten cold or cooked from frozen. Shrimp: Shrimp also thaw best overnight in the refrigerator. For quicker thawing, take the shrimp out of the package and put in a bowl of cold water, letting a trickle of cold water run into the bowl while excess water goes down the drain. The shrimp should be ready to cook in about 15 minutes using this method. Shrimp can also be boiled from frozen.